Hi Everyone! Sorry for the delay in getting this post out. I graduated from Drew University a few weeks ago and have been busy seeing family and friends. After my short break, I am back and ready to keep you informed! Going forward, I plan to have a new disease post at regular intervals, so make sure to follow Disease Detective to keep up to date! 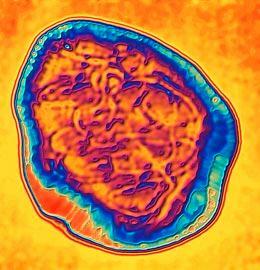 This week, I am writing about measles, also known as Rubeola. Measles gained popularity in the media last year when a widespread outbreak began at Disneyland California and sickened many Americans across the West coast. Below, I have outlined the major facts about measles. Measles is an extremely contagious disease that is caused by the measles virus. The measles virus is commonly spread through contact with infected body fluids and through the air via sneezing and coughing. Globally, measles is one of the leading causes of death for young children. The early symptoms of measles include fever, cough, sore throat, and a runny nose. As the disease progresses, a rash begins to spread across the body, starting on the face and neck, and extending to the rest of the body and limbs. No antiviral treatments exist to treat patients with measles. The standard of care for those who are sickened involves providing supportive therapy to help the body fight off the virus. Patients who do not receive treatment will usually die from complications as a result of the measles virus. Common complications include severe dehydration and high fever, but some severe case may be accompanied by encephalitis and pneumonia. Fortunately, there is an effective vaccine to protect children and adults from contracting the measles virus. The MMR vaccine (measles-mumps-rubella) is administered in two doses to children to develop immunity against the virus. The measles vaccine has been used for over 50 years and is proven to be highly effective and safe. Additionally, vaccinating a child against the measles is very affordable, costing about $1. The WHO has established a goal to eradicate measles by the year 2020. This goal will be reached through an international vaccine effort, coordinated by the WHO. Many measles outbreaks in the United States, where vaccination against measles is mandatory, arise from one of two sources – either an unvaccinated individual travels oversees and contracts the disease, bringing it home and spreading it to others who are unvaccinated; OR a foreign individual who has the measles comes to the United States and spreads the disease to unvaccinated individuals. Keep following Disease Detective to learn more about other diseases! If you have a suggestion for future topics or hear of an interesting news story about diseases that you would like me to address, please comment below! This entry was posted in Current Diseases and tagged antiviral, California, CDC, Disease, Disneyland, encephalitis, eradicate, fever, Measles, MMR, rash, rubeola, treatments, Virus, World Health Organization. Bookmark the permalink.